There’s no need to go thirsty in New Orleans. Bars sell drinks in to-go cups so you can have your beer or a cocktail on the street. And now there are vending machines in some city cabs to ensure that parched passengers can sip soda in the back seats. Garber told NBC News that it was his teenage son who first suggested the idea and, after several years of tinkering with the concept and the machinery, Garber figured out a way to install a vending unit in a cab trunk that can deliver cold soda to the back seat. About 40 of his city cabs have started testing the units. We took a morning “ride-along” — by cellphone — with cab driver Kirk Lee and Kelly Robin, the first thirsty passenger of the day. Robin, a server in a French Quarter restaurant, ordered a Dr. Pepper from the five choices on the screen during her short trip to work. Her driver agreed. “People come to New Orleans to have a good time and do something different than normal. 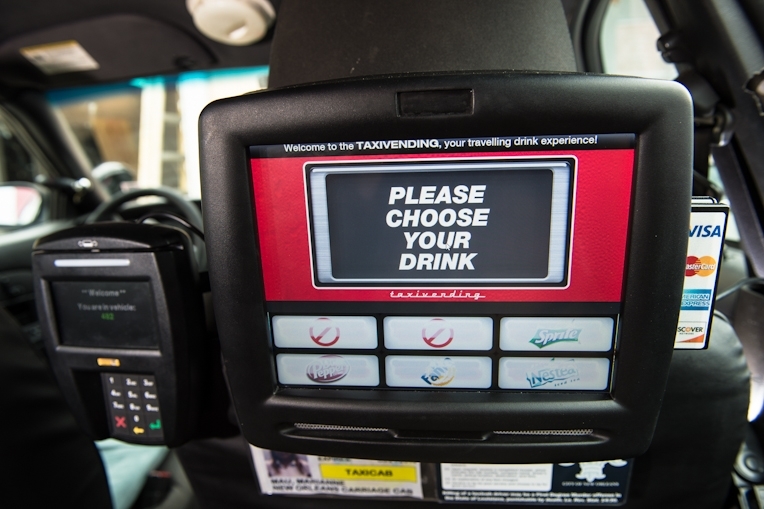 Having this novelty in the cabs, especially on the ride in from the airport, is a great way to start,” said Lee. He thinks cab drivers might come to appreciate the unusual amenity as much as the passengers. It will also help reinforce the city’s reputation as a hospitable place to visit, said Mark Romig, president and CEO of the New Orleans Tourism Marketing Corporation. “It really adds to the visitor experience, especially when you consider that 50 percent of our visitors arrive by plane,” and that most tourists take cabs into the city, a ride that typically takes between 20 and 30 minutes. If it does, Garber is ready. He plans to install vending machines that will sell soda and, someday maybe cologne, small umbrellas and other items, in all 250 of his New Orleans cabs and, soon, in the hundreds of cabs he owns in New York City and Chicago, too.